(ORDER BELOW) About Our Traditional Hongyuan Bao Ba Cha “8 Treasure Tea”, is a special blend of eight plant ingredients (treasures): dried flowers, berries, dates, seeds, stems, tea leaves and sugar. Besides each ingredient having its own unique flavor, Eight Treasures Tea is refreshing and the Chinese believe that it has medicinal properties that help to: decrease body heat, promote digestion, induce appetite and relieve fatigue–to name a few. Each ingredient has it’s own unique healing properties by traditional Chinese medicine. Hongyuan: which is our only variety that comes with LARGE rock sugar and the only one that comes with a tea bag. Small Treasure: which is the same blend as Traditional, but comes with small rock sugar. Bountiful: which is the same blend as Traditional, but without sugar. INGREDIENTS: Green Tea Loose Leaves, Chrysanthemum Flower, Honeysuckle Bud Flower, Chinese Dates / Jujube Berry, Haw Berry, Cassia Seed, Liquorice Root, Tangerine Rind. SUGAR FREE! Sichuan tea is generally consumed Gay Cha Wan and not gung fu cha. It is said that the gaiwan, literally “bowl with lid” was invented during the Jian Zhang (780 to 783) during the Tang Dynasty by the governor’s daughter Cui Ning who was managing Sichuan. Finding the cup too hot to hold in the hand, it would have drawn a small cup saucer marrying stably to lift without burning. Later was added the cover, to keep the sheets suspended in the cup. These three parts called “San Pao Tai” are held simultaneously in Sichuan and the tea is drunk directly gaiwan in there with his lips, using cover to avoid the tea leaves out of the cup. This mode of infusion teas naturally favors longer, and perfectly suited to the Sichuan tea such as jasmine tea. This delightful beverage, Berried Treasure Eight Treasure Tea Ba Bao Cha, is a special blend of seven different plant ingredients. Eight Treasure Tea is refreshing and it has medicinal properties that help to: decrease body heat, promote digestion, induce appetite and relieve fatigue. This delightful beverage, Treasure Trove Eight Treasure Tea Ba Bao Cha, is a special blend of eight different plant ingredients. Eight Treasure Tea is refreshing and it has medicinal properties that help to: decrease body heat, promote digestion, induce appetite and relieve fatigue. This delightful beverage, Lemony Snicket Eight Treasure Tea Ba Bao Cha, is a special blend of eight different plant ingredients. Eight Treasure Tea is refreshing and it has medicinal properties that help to: decrease body heat, promote digestion, induce appetite and relieve fatigue. Each Hidden Heart Blooming Tea Ball is handmade. Organic green tea leaves are picked, dried and hand-spun into a ball. What hides inside these Sleeping Dragons is a flower that unfurls when hydrated, that looks like a sleeping dragon. Flowers of Carnation blossom, and Silver Needle White Tea. PLEASE NOTE: Each tea ball, steeped in 8 oz. of hot water, can be re-steeped up to 5 times each tea ball. Each Fairy Princess Blooming Tea Ball is handmade. Organic green tea leaves are picked, dried and hand-spun into a ball. What hides inside these Sleeping Dragons is a flower that unfurls when hydrated, that looks like a sleeping dragon. Flowers of Camellia, Butterfly, and Tropaeolum. Each Golden Staircase Blooming Tea Ball is handmade. Organic green tea leaves are picked, dried and hand-spun into a ball. What hides inside these Sleeping Dragons is a flower that unfurls when hydrated, that looks like a sleeping dragon. Flowers of Chrysanthemum, and Silver Needle White Tea. Each Honeymoon Blooming Tea Ball is handmade. Organic green tea leaves are picked, dried and hand-spun into a ball. What hides inside these Sleeping Dragons is a flower that unfurls when hydrated, that looks like a sleeping dragon. Flowers of Jasmine, Crysanthemum, and Silver Needle White Tea. Each Sleeping Dragon Blooming Tea Ball is handmade. Organic green tea leaves are picked, dried and hand-spun into a ball. What hides inside these Sleeping Dragons is a flower that unfurls when hydrated, that looks like a sleeping dragon. Flowers of Lily, Jasmine, and Silver Needle White Tea delivering a delicate Apricot liquid. Wonderful iced or hot. Know someone who already has everything? Know someone who loves tea? Know someone who loves to try new things? Looking for a unique gift idea? We will also include a discount coupon for your recipient, to order more of their favorite individual teas or to subscribe to our monthly tea shipment service! Subscribe to our unique monthly tea gift program called MoTea — as in MOnthly TEA subscription! The subscription price includes a total of 108 servings of our variety of teas (most tea packets can be brewed more than once). This offer is worth over $300–so you’ll also SAVE $100!!! Customized tea boxes are available in a variety of box sizes, tea varieties, and quantities. 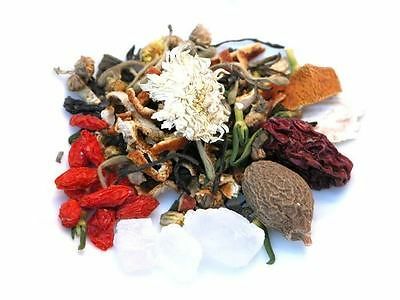 Though we are happy to customize your order, usually the first order comes with 30 individual varieties of our teas. Perfect to offer in Bed & Breakfasts, Day Spas & Salons, Therapist and Corporate Offices, Waiting Areas, to name a few. Price includes: new box to hold and display teas, filled with 9 varieties of our most popular 8 Treasure Teas (and/or blooming tea balls)–individually-labeled tea bags–and comes with printed instructions on how to brew our special teas. Order upon request: additional 30-individual, variety 8 Treasure Teas (and/or blooming tea balls) shipped to you each month, to refill your original tea box. If you don’t know what Eight Treasure Tea is, or have never tried it, just place an order for a free sample! TeaBling.com is the exclusive distributor of 9 varieties of Traditional Hongyuan 8 Treasure Tea.